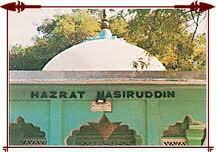 Hazrat Khwaja Naseer-ud-din Mahmud Roshan Chiragh Dehlvi ( Chiragh-e-Delhi ) Rahmatullah Allaih was birth name was Nasiruddin around 1274, at Ayodhya, Uttar Pradesh His father Hazrat Syed Yahya ( Rahmatullah Allaih ), who traded in Pashmina, and his grand father, Hazrat Syed Abdul Latif, first migrated from Khorasan, north-eastern Iran, to Lahore, and thereafter settled in Ayodhya, in Awadh. His father died when he was only nine years of age, thereafter growing up with his mother, he received his early education from Maulana Hazrat Abdul Karim Sherwani, and later continued it, with Maulana Hazrat Iftikhar uddin Gilani . He took Wisaal in 17 Ramzan 757 Hijri or 1356 AD. at the age of 82, and is buried in a part of Delhi, India which is known as "Chirag-e-Delhi" after him . One of his noted disciple was great syed sadath from Hassani and Hussaini chain namely Hazrat Syed Muhammad popularly Khwaja Bande Nawaz Gezu Daraz ( Rahmatullah Allaih ), who later moved to Daulatabad around 1398, owing to the attack of Timur on Delhi, and from where at the invitation of Bahamani King, Firuz Shah Bahamani, moved to Gulbarga, Karnataka, where he stayed for the following 22 years of his life, spreading the Chishty Order in the South till his Wisaal-e-Mubarak in November 1422. The Dargah of Khwaja Bande Nawaz (Rahmatullah Allaih ), exists today in the city of Gulbarga, as a symbol, multi-religious unity. During his stay in Delhi, he continued to visit Ayodhya often, where he made a number of disciples, notably, Shaikh Zainuddin Ali Awadhi, Shaikh Fatehullah Awadhi and Allama Kamaluddin Awadhi . After his Wisaal-e-mubarak, his dargah shareef ( tomb ) was built by Firuz Shah Tughluq (r. 1351 - 1388), the Sultan of Delhi in 1358, and later two gateways were added on either side of dargah shareef ( mausoleum) . One of noted addition was a mosque built by a later Mughal emperor, Farrukhsiyar, in early 18th century , and popular among both Muslims and Non-Muslims. A humble tomb of the founder of Lodhi dynasty, Bahlul Khan Lodhi (r.1451-89) lies close to the dargah shareef ( shrine ) in the present day locality of ‘Chirag Delhi’ that grew around the tomb, and is still goes by his name, it is very close to the locality of Greater Kailash, in South Delhi. wow nice really thanx share the about the fashion ... i really appreciate you..